This entry was posted on September 10, 2012 at 5:00 am and is filed under Barack Obama, Conservative Issues, Economy, first Jeremiah Wright term, George Bush, oil, taxes. You can follow any responses to this entry through the RSS 2.0 feed. You can skip to the end and leave a response. Pinging is currently not allowed. High gas prices are just another tax from liberals. People don’t understand that state and federal taxes DWARF the profits that “big oil” make on gasoline. We could have reasonably-priced gas tomorrow if the government bureaucrat liberals got their hands out of our wallets every fill-up. I left the house yesterday, and, while driving down the street, noticed gas had finally reached the 4$ per gallon plateau -this in northwest Ohio. Although I can see what the elevated gas prices are doing to the local economy around here, for obvious reasons, I hope they stay this high and higher up into the election. One must not forget the main reason why gas and oil prices are so high right now is the Federal Reserve policies. The massive money printing from the easing since the crash of 08′ has artificially inflated all commodity prices, especially oil. Not only do we have to get Obama out, but helicopter Ben Bernanke needs ousted, also. He is a madman who is hell bent on destroying the dollar. Here shortly, the Fed will more than likely reveal their intentions regarding QE3, which democrats are screaming for. I don’t know if they will implement QE3 before the election, but you can bet, at some point in the near future, they will. My main ride takes premium, which in California costs over $4.30 a gallon now. So I don’t follow regular unleaded every day. But I’m pretty sure that regular unleaded is over $4 a gallon in the Soviet Socialist Republic of Californiastan. You are of course spot-on. Gas prices are essentially a tax. We could have low gas prices with sound fiscal policies, or we can have high gas prices with unsound fiscal policies. I wrote a response to a turd who tried to blame Bush for Obama’s massive 2009 spending. You can see just a few of the spending bills that Obama passed just in that year here. We are now facing QE THREE. That’s because QE1 and QE2 failed and the Fed is desperate to do what little it can to try to dig America out of the deep, DEEP hole Obama has dug America into. When they print money (they don’t even do that; actually they just add zeros to the Fed computers to “create” more money) to buy bonds that no one else will buy at current interest rates, they artificially reduce interest rates at the expense of inflation of real goods like gasoline and food. These things are SKYROCKETING and they are doing so BECAUSE of Obama’s failed policies. Yes, you can argue that the Fed policies are wrong, but the Fed’s policies are 1) a result of Obama’s policies; and 2) Obama appointed the key people who are making the key decisions at the Fed. Ben Bernanke’s problem is that he’s an “expert” on FDR’s New Deal. Only he profoundly misunderstands the ramifications and disastrous costs of the New Deal and fails to understand that it was a disaster that prolonged the Great Depression by seven full years as recent scholarship is finally concluding. So Bernanke is “brilliantly” trying to purse failed policies as the answer to our current problems and is only helping to dig us into a hole too deep to crawl out of. I’m going to start this off by saying I think all politicians lie, left/right or whoever. It’s a disease. But if you look at the numbers, the percent of change for Bush was about 87% in his 8 year term. So far, the percent of change for Obama is about 74%. Not saying it’s good, but overall hasn’t changed as high as Bush. The real problem is not with the President (Bush/Obama). The real problem is with Congress. A president can not pass a bill by himself, it requires Congress to pass a bill and the president to sign it. Therefore Congress as a whole (Dems and Repubs) have failed us. You are not only wrong, you are a liar. And I block liars. I provided the numbers that DOCUMENT the price of gas right here. You provide a completely dishonest assertion that flies in the face of the facts. Your “87%” and your “74%” are outright fabrications. The very article you are commenting upon PROVE they are outright fabrications. Because the numbers I cite are official U.S. government figures. Versus your dishonest lies. I provide the average price of a gallon of gas during both president’s first terms as well as compare Bush’s entire 8-yr presidency with Obama’s first term to date. I prove you are a liar. When George W. Bush took office on January 20, 2001, a gallon of unleaded gas cost $1.47 a gallon. When George W. Bush left office, a gallon of unleaded gas cost $1.85 a gallon. I’ve documented those numbers before. That is a 25.85% “percent of change” increase under Bush, you liar. If you take that same $1.85 price that Bush handed Obama, and realize that gas this week is $3.84, the percent increase of change is 107.57% so far under Obama, you wretched liar. Notice how both here and in my article, I provide something called “facts.” I document what I am saying. You provide snivelling lies. Get lost and take your dishonesty elsewhere. Which is just all the more reason to tell you to get lost, liar. P.S. What I do in this article is provide the annual figure for each year of the average price of gas over that year AS GIVEN BY THE FEDERAL GOVERNMENT. I do that for all eight years of Bush, and I do that for the first three years of Obama. That data was not available as an “annual” figure for 2012, but again, I use federal government figures to calcuate the annual rate so far. And what I provide is the average price that you paid during the entire Bush presidency as well as the first four years of the Bush presidency versus what you have paid under Obama’s presidency so far. There is simply no better measurement. And by that measurement, you are paying dramatically more under Obama than you did under Bush. And if Obama is reelected, you aint seen NOTHING yet. You will see shocking increases in the price of gasoline under a second Obama term particularly due to the terrible failures we are seen in the Obama policy in the Middle East as I write this. I was not doing any in depth analysis. Just looking at the numbers you posted. I never said it wasn’t Obama’s fault. If you noticed what I did say was it’s not the president that failed. I INCLUDED BUSH on that too. Where I did put the blame was on CONGRESS!!! See Congress. Perhaps you should understand what I meant before blasting me. If you block people for having a different view that’s your right, but I didn’t attack you. I was having a conversation. I can at least now see how you arrived at your numbers (you took the starting value of $1.61 and the ending value of $3.01 for Bush and the starting value of $2.14 and the ending value of $3.72 for Obama). But that is NOT HONEST. Because gasoline WAS NOT $2.14 a gallon when Obama took office – it was $1.85 when he took office. And gas was very definitely not “$3.01” when Bush left office. So your “math” simply artificially reduces Obama’s price and illegitimately and underhandedly gives it to Bush. Nobody in the history of the planet ever calcuated “the average price of a gallon of gas over a president’s first year in office” and “the average price of a gallon of gas over a president’s last year in office” to calcuate a “percent of change”. You are welcome to show me where ANY OFFICAL STATISTIC has EVER done that ANYWHERE. I just did a search to see if anybody else ever came up with an “87% percent of change” for George Bush’s gas prices and do you know who I found doing that? You and only you and nobody BUT you. That is why I didn’t recognize your “percent of change” garbage; because it is entirely contrived and arbitrary and meaningless. The statistic that I produce is far more accurate and far more realistic because it takes into account every single month of every single year for each year of both president’s terms. Because, you know what? I don’t know about you (maybe you were in prison between 2002 and 2007 and then again between 2010 and 2011 because you’re just a really nasty piece of trash), but I actually put gas into my vehicles every year and every month in 2001, 2002, 2003, 2004, 2005, 2006, 2007, 2008, 2009, 2010, 2011 and 2012. And it would be nice if your “percent of change” bothered to reflect that fact. Let’s just say, for the sake of argument, that Israel attacks Iran and gas prices go up to $14 a gallon for a week. Would you say it would be right for me to look at the $1.85 a gallon he started with and compare it to that very highest point of $14 a gallon and say that Obama’s price increase percentage was 657% What the hell would that even mean? Especially if the following week the situation was resolved and gas prices returned to their (still very high) level of $3.87. That’s a relevant question because 1) that’s EXCACTLY what the left did to Bush and 2) it is actually very possible if not probable that Israel may very WELL attack Iran before Obama’s term is done which WOULD drive up gas prices. That “87%” and “74%” crap is every bit as arbitary and unfair and illegitimate as demonizing Bush for a “275% increase” as that turd I link to did. The other bone that I’ve got against you is the fact that – as I document with Obama on video – Obama became president by demonizing Bush for gas prices. What exactly is your argument that Obama ought to be able to demagogue gasoline prices to get into office but that it would now be wrong to demagogue Obama for his gas prices the same way he demagogued Bush??? You know, apart from a completely arbitary and hypocritical double-standard??? When George W. Bush took office on January 20, 2001, a gallon of unleaded gas cost $1.47 a gallon. When George W. Bush left office, a gallon of unleaded gas cost $1.85 a gallon. I’ve documented those numbers before. That is a 25.85% “percent of change” increase under Bush.. If you take that same $1.85 price that Bush handed Obama, and realize that gas this week is $3.84, the percent increase of change is 107.57% so far under Obama. But Obama’s first term isn’t over yet, and prices are going UP. So I looked again at the national average price of gas for 9/15/12, and it is $3.89. So I was wrong saying it was 107%; it’s 110%. That is a far better measure than the one you created. If you want a “percent of change,” look at what the president in question inherited and what he ended up with. I used the official average annual numbers to calcuate the average price per gallon during each president’s entire presidency. And if you look at Bush’s entire presidency, you’ll see his average gas price was $2.14 a gallon. If you do a more apples-to-apples comparison to Obama and only consider Bush’s first term, you’ll see his average price was $1.68 a gallon. 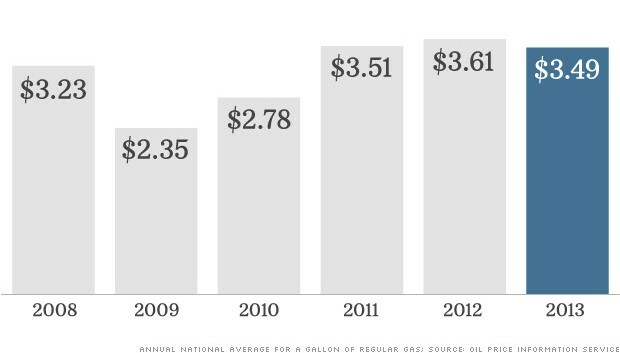 Compare that to Obama’s average price thus far in his first term of $2.99 a gallon. Bush wins again. In 2007 and 2008, when Obama was demonizing and demagoguing his way to the presidency, he COULDN’T BLAME CONGRESS BECAUSE DEMOCRATS OWNED BOTH THE HOUSE AND THE SENATE. Obama blamed Bush and ONLY Bush. I am doing nothing beyond holding Obama accountable to the very same standard he insist Bush and Republicans be held to. And I rather wonder if you were blaming the Democrat-controlled Congress in 2007 and 2008 when gas prices were at their highest of Bush’s presidency. I rather doubt it. Are you going to blame Obama for the low gas prices (currently under $2/gallon in many places) too? Just curious. Does it bother you to be such a lying weasel and pretend that Obama has somehow been better on gas prices when the FACT is that Obama has averaged nearly a buck more a gallon over Bush??? Does it bother you that you have to be a pathological liar when you deny the FACT that up to this point we are paying 45% MORE for a gallon of gas than we did during the 8 years when Bush was president??? Does it bother you that you have no virtue or integrity whatsoever??? You seem a little sensitive on this issue. Thanks for the laugh. Ignoring the ad hominems in your reply, thanks for citing your sources. Your facts there are correct. But you didn’t answer the question. Are you going to blame Obama for the low gas prices as well as the high? I appreciate that you acknowledge the fact that Obama has been a solid dollar over Bush on average gas prices. As to your question, when Obama actually brings down the price of gas to the level that Bush did, I suppose maybe THEN your question would have merit. As it now is, you are operating under the tacit assumption that Obama has good oil prices, when on average he has NOT had good oil prices. As I documented. 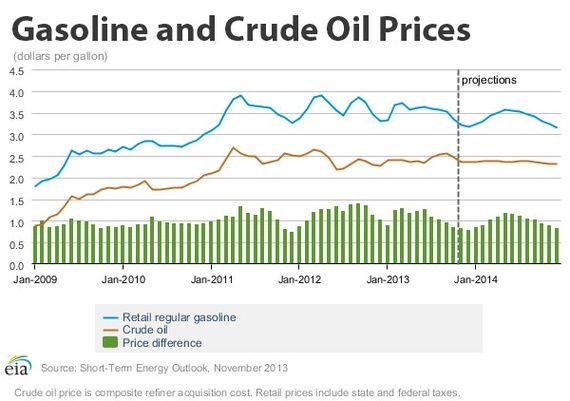 Low gas prices are good for Americans and good for the US economy which floats on oil. Right now, there are both good and bad reasons for low oil: the good is the oil companies’ development and use of fracking technology that Obama has done everything he can do to block and which he has banned on all federal lands that he has any control over. On this good reason for lower oil prices (due to increased supply according to the economic law of supply and demand), Obama deserves NO credit for low oil prices. The bad reason for low oil price is that the world is anticipating a global recession. Which is hardly a good reason that anyone who is not insane or evil would take credit for. Obama has been and continues to irrationally claim that he has created a strong and stable economy. Which the overwhelming majority of Americans according to poll after poll know is a lie. In fact the economy is quite bad under Obama. But the world economy is even worse. Because socialists are largely running the world (In China, in Russia, in Europe, etc.). So I certainly blame leftist socialism for the global recession that everyone sees – well, everyone but Obama – sees coming. But I don’t believe that Obama made former KGB thug Putin a socialist. Nor do I think Obama made China socialist. Nor do I think Obama made Europe socialist. He DID make America socialist, though. And I blame him very rightly and very legitimately for that. Hey lets go back and look and see now what the average gas prices are. And that $9 to $10 a gallon, doesn’t seem like that happened, you were just so smart. I love how wrong people are and after he is out people will see he actually spent money where we needed to and not where he wanted. I know that’s a crazy thought for some republicans, but it is true. What a true turd you are. You DO remember when gas prices temporarily spiked in 2008 when Democrats were running the House and Senate and all the hell they unleashed on Bush blaming him??? You DO remember what YOUR SIDE did and said, don’t you, you hypocrite? And what did gas prices do by the time Bush left office? They were under $2 a gallon. In other words, thank you very much for pointing out what a true hypocrite you are as you hang YOURSELF by the very standard that you will hang on me. Everything I wrote was true: even the $9-$10 a gallon figure comes out of Obama’s own damn Energy Secretary at the time. YOU PEOPLE TRIED to raise gas prices because of your idiotic environ-MENTAL whackjob religion. Fracking made Obama fail. And now the depressed global economy has brought prices down further. Unfortunately you aren’t quite smart enough to understand either history OR the law of supply and demand.